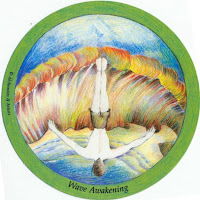 The image and title of the first card make for a rather different take, but the concept remains a familiar one. Wave Awakening, or the Knight of Cups in regular court terms, represents the idea of the dreamy-eyed romantic, a person overcome by passion, idealized ideas of what is or what should be. He rushes forward, dives into the waves so full of that lust, ready to see what he wants to see. The water must be warm and deep, rich with rainbow-colored tones and just waiting to wrap him in its embrace. Everything will be perfect, in this starry-eyed vision of the world. It is a vision full of "should" and "fair", things imagined in so much detail, a sort of narrow, stubborn focus. 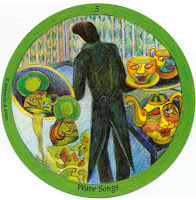 The Five of Waves songs, as the Cups suit is called, shows where such an attitude can so often lead to - disappointment, disillusionment, misery and moping. Even here, the way of looking at the world is not much changed: unhappy, but still with those ideas about how things should be, that perfectly imagined dream at the center of everything even if now it is broken to pieces and scattered across the floor. Look at those tea cups - pretty, with elaborate designs and vivid colors painted on. No doubt an expensive set; a sturdier set, with cups enough to spare for the occasional accident, could have been purchased at a far lower cost. But that, of course, would not have been living the dream, the romanticized idea of what life ought to look like and include. Now, instead of thinking pragmatically on how to move forward, how to clean up and continue on and learn what lessons can be learned from the mess in front of him, the figure merely stands and sobs, weeps. Woe is me he says, stares at what is spilt, broken, done with. Though most of us have (unfortunately) encountered individuals who truly personify this outlook, and though we may be far more sensible than that by and large...most people, I think, struggle with this tendency sometimes, in some particularly area of their lives. The idea of the perfect relationship that never seems to work out, the job that is never what you are looking for in a job, the kid who doesn't act or look like the kid you always wanted to have...it can be many things. It's a struggle, to retain our optimism and dreams without falling into the trap of over-romanticizing things. It is hard to fully internalize and accept, without bitterness, certain simple facts: that the world does not owe you anything, that there are no real measures of what is 'right' in a partner or a job or anything else that are the same for all, that what you want to be is quite often not what is or what can be, that some things will simply never work out and that fairness has very little indeed to do with how things in the world tend to work out. It is difficult to learn and to remember this: how to see the world for how it really is and still dive, not into some imagined, gleaming pool but rather into waves that you know are frigid and turbulent, will have you shivering, kicking and flailing madly just to stay afloat; to see the broken cup and simply sigh, pick up the pieces and toss them, bring out the mop, brew more tea and pour it again. It takes time to learn to drink from chipped and cracked mugs without that melancholy regret. Your post made me think of a book by Byron Katie called "Loving What Is" - it is about accepting rather than arguing with reality.